Who was the centre of attention in front of and near Victoria's Parliament House yesterday? Reclaim Australia and their associates wanted to provide a double focus of attention: themselves and Muslims living in Australia. 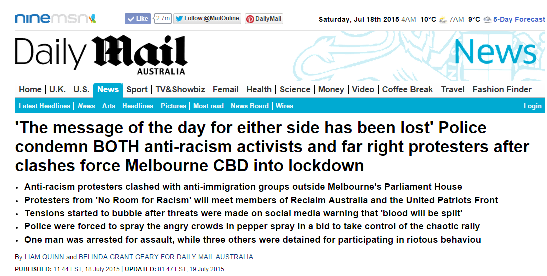 No Room for Racism and its sympathisers were equally determined on a dual focus: to counter the racism of Reclaim Australia and its cohort and to make the public aware of their organisation. Did the events of the day go as planned for both sides? Possibly. Possibly not. However, it seems that there were elements on both sides who were prepared for trouble one way or another. A group with a similar title to Reclaim Australia hit Ballarat early in 2014. Restore Australia arrived in Ballarat trying to incite antagonism to the building of a mosque in the city - a city which was the site of Australia's first document demanding democratic rights. As can be seen from this Facebook presence, drumming up opposition to the mosque being built by Ballarat's small Islamic community was not too successful. What Restore Australia did not take into account in the Ballarat situation is that community friendships had already been forged within the broader community by the time they blew into town. The local Islamic community had friends - a broad spectrum of friends. And the then Mayor was an early responder. Meanwhile, amid all this swirling of clashing tensions and violent police intervention, what were Muslims doing? Yesterday was the beginning of Eid celebrations. Muslims were enjoying themselves. Behind them was a month of fasting. Now can come the feasting. Perhaps Reclaim Australia chose the day and date deliberately with an intent to insult Muslims - or perhaps they knew there would not be a Muslim in sight or hearing of their rampage! The Faith Communities Council of Victoria has issued the following statement. The Faith Communities Council of Victoria (FCCV) has issued the following statement in light of reports that over the weekend of the 18/19th July 2015, Reclaim Australia is planning nationwide rallies which we believe are divisive and not in the nation’s best interests. The acceptance of our multicultural and multifaith society is one of Australia's greatest achievements and assets. The celebration of this rich diversity that exists in our society ensures we remain innovative, resilient and globally competitive - all of which enhances our society and increases our standard of living. Like any asset, our multicultural and multifaith identity needs to be continuously nourished and threats to undermine it need be addressed. The current environment fueled by economic uncertainty and fear is encouraging the rise of extreme groups like Reclaim Australia and UPF (United Patriots Front), who are intent on disenfranchising minorities and disturbing the peace within our society. These groups demonstrate they possess anti-Muslim, anti-Asian, anti-Indigenous, anti-Semitic and anti-Refugee sentiments. We, the Faith Communities Council of Victoria, actively discourage any kind of involvement with these groups and see them as a threat to peace and social cohesion within our society. We believe there has to be a continuous dialogue promoting multiculturalism and multifaith. We also encourage all to discourage others from supporting these groups in any way. The harmony and diversity in our society is the basis of the beauty of Australia, and we request your support in maintaining this.